While giving a public tour at the winery I work at, I met three Macedonians. They were friendly and asked me if I knew anything about Macedonian wine. I said I had little if no knowledge of Macedonian wine, admitting to some familiarity with the history of Alexander the Great and Aristotle. "Of course," the young woman said. Thinking for a moment, hoping not to appear too uncultured I said, "I know the language is similar to Greek.... Actually, my step-brother married a Macedonian." The male in the group rolled his eyes and said sarcastically, "My condolences..."
To which he replied, "I'm not surprised." Strangely, the two ladies in his company then gave him a solemn, as if knowing glance, seemingly acknowledging some hidden truth in his sardonic response. Aside from male and female relations in Macedonia, let's take a peek at the history. For those who sat through Alexander by famed filmmaker, Oliver Stone, or listened to lectures in Ancient History class in high school, you may remember Macedonia as once being the head of a vast empire. Philip II, Alexander's father took control of the Greek city states in the mid 4th century B.C. After his death, his son Alexander extended the kingdom's borders. Taking his armies eastward, Alexander gained control of Persia, Egypt and lands bordering India. Unfortunately, he died at the age of 32 in 323 B.C. but his legacy continued to influence such military leaders as Ceasar, Marcus Aurelius and Bismarck. By 167 BC, Macedonia's political power had substantially waned and like many Greek cities, fell under the sway of the growing Roman Empire. It is said that the members of the Macedonian royal family were heavy wine drinkers (perhaps as a result of their fall from world power. That... or something to do with male-female relations... which might explain why my step-brother loves - needs? - to drink). Today, there is the Republic of Macedonia, a landlocked country bordered by Serbia, Bulgaria, Greece and Albania and the region of Macedonia in the country of Greece (where the original royal cities of Alexander's fame lie). The Republic of Macedonia is hot (a climate ranging from Mediterranean to Continental), mountainous and prone to earthquakes. Overall, the conditions are very favourable for growing both table and wine grapes. Presently there is an estimated 55,330 acres/22,400 ha of land devoted to growing such popular international varieties as Cabernet Sauvignon, Merlot, Laski Rizling (AKA Welschriesling), with some Chardonnay and Sauvignon Blanc as well as the indigenous grapes of Vranac, Kratosija and Zilavka. There are three main wine-growing regions. The most important is the Povardarie (or Povardarje) region around Skopje (Скопје) followed by Pcinja-Osogova region on the Bulgarian border and Pelagonija-Polog surrounding Lake Ohrid on the Albanian border. One can find the Bovin winery in the Tikvesh District of the Povardarie Region in the town of Negotino (Неготино). Established in 1998, Bovin is regarded as the first privately owned winery in Macedonia. Presently they own 60 hectares of land in Tikvesh. The winery uses environmentally friendly practices in their vineyard along with the most modern of production equipment for fermentation and maturation. Along with the many international varieties, Bovin grows the Vranec grape, easily the most popular and important in the country. Indigenous to both Montenegro and Macedonia, Vranec produces a rich wine with intense red and black berry fruit. For those who love their Primitivo from Puglia or their California Zinfandel, DNA profiling has recently revealed that Vranec may be related to the Italian variety from across the Adriatic. The 2007 Vranec from Bovin is incredibly rich with lush blackberry fruit and a hint of earthy licorice. If you've grown tired of Malbec, this is a nice change. A wonderful value and available at the LCBO for $13.95. My father and step-mother recently returned from a trip to Northern-Western Europe. They visited Amsterdam, Bruges and Paris. Before they left, I asked if they could bring back a bottle of nice French wine, something special they found along the way. Last night I dropped by their house with two bottles of fun French wine to celebrate their homecoming. My father pulled out a beer t-shirt from Belgium, a beer calendar, a pencil drawing of Amsterdam and my French wine, a 1999 Bordeaux from Lalande de Pomerol. Bordeaux is huge, vast and much larger than Burgundy, being greater than the vineyard acreage of Germany. There are about 15,000 wine growers at work and the region easily produces 700 million bottles yearly. The small bottle apparently cost my parents 20 euros. They bought the wine in Paris at a street-side stand. The man wore a traditional Parisian straw hat and a red-white striped apron. I wanted to open it last night but my father urged me to save it for a special occasion. I took my 375ml bottle home and promptly opened it this morning - around 11:45.... I was trying to be patient. First off, a lovely bouquet, dusky and dark. Earthy, black cherries with a spicy-damson vanilla touch. On the palate, there is a rich plum-chocolate presence matched by a more than velvety wave of vanilla. Strong tannins guide the wine, the mid-palate is warm but I admit slightly bare. It's the first sip and the finish that are the wine's best features. Sipping the wine I turned to my Hachette Guide to French Wines. It is an older edition (2004) but helpful. Their note on Château Moncets: "This lovely 19th century house has been in the same family for 130 years. It is surrounded by an attractive park and a vineyard planted on clayey soils." For the 2000 vintage, the guide recommended drinking the wine with 2-5 years. Pomerol, like its famous and much larger neighbour, St-Émilion, is considered part of the Right Bank of Bordeaux. The wines are opulent and Merlot-dominated (as opposed to the Cabernet-Sauvignon-dominated wines of the Left Bank's Médoc). I find it interesting that in the early 20th century, the wines of this small region (780 ha/1,930 acres) were popular with Belgium wine merchants (my parents fell in love with Bruges and their travels throughout Holland and Belgium brought them in contact with the wine I'm enjoying). The wines of Pomerol often went to markets in Paris, Belgium and Holland while the traditional Left Bank Bordeaux wines continued to provide England with their 'clarets' and sweet wines from Médoc, Graves and Sauternes. Lalande-de-Pomerol is immediately north of Pomerol. Though the wines are often considered 'rustic', their concentration and body is similar to their southern neighbors at a fraction of the price. Lalande-de-Pomerol is also a little bigger in vineyard size at 1,100 ha/2,700 acres. The land is cheaper than in Pomerol with investors coming from St.Émilion and other established properties to make some excellent and affordable wines. It's hard to recommend a wine that is difficult to find. I dislike it when wine writers discuss wines that only the select few can uncover, uncork and wax poetic about. As much as I love wine, the exclusivity of the industry can be intolerable and the elitist attitudes of many leading wine critics continually keep the doors shut, as if barring entrance to those looking to find a means into discovering the fascinating nuances of an agricultural product. There is something to be said when philosophers like Pythagoras have cryptically noted that one should avoid the common road. The mainstream is a victim of its own success. All things excellent are as difficult as they are rare as the philosopher Spinoza once put. Sipping alone can be lonely and challenging (especially with a Bordeaux) but there is something beautiful about the solitary. 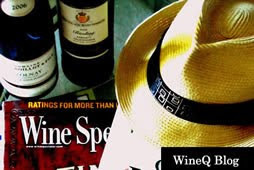 I like to write about wine from the perspective that it is available to all but everyone's tastes are different despite the vast availability of international style wines. We all have our fun finds and discoveries. The best wine writing should both edify and entertain. As much as I enjoy this wine, I still have a difficult time with Bordeaux. The region alone suggests tradition and pedigree, failing not to mention it's allure and imposing wall of snobbery and expensiveness. The wines are seductive and never cheap and sadly, at best they remind me of the expensive prostitutes one might find in the Red Light district of Amsterdam. You are drawn in, you are romanced but unless you have the resources, your wallet will only feel lighter. Bordeaux is for the business men who are rich and even though I love to drink, and this is the kind of wine much appreciated by my ancestors in Holland, I somehow feel like a stranger in paradise in its presence. The Hachette Guide to French WInes 2004. Mitchell Beazley, London, 2003. I have the most trouble with the passing of time. There is inside me this grievous difficulty, a rebellion but also a petulant child screaming to re-exist in a certain moment and cherish the evolving echo of its passing. . I long for the recapture of a given moment. Nothing gives me greater pleasure than the joy of thinking that somewhere in our lives there is a door, an entrance into which we can briefly re-enter the previous places we have seen, been, encountered and experienced. Don't let time go, don't. But it does. It runs through our hands like flowing water from a tap, like wine across our palates. We pick up drops here and there but the flow is unkind, it is heavy and we are given only the wherewithal to indulge what we touch. Everything else seems to be meant for something, a somewhere else we can only imagine. Just as the water slips around us, just as the wine escapes into our bodies, all of it ends up in the drain, into the void after the present. I chatted with co-workers, I watched the sky. It had been overcast for several hours. Then, throughout the tasting it burst here and there. The sky sobbed, the drops like pebbles. We scurried to one side of the bar to avoid getting wet. I didn't care. I got lost for a moment. Brown eyes blinked. They haunted me and I flirted with their owner the one in the white shirt, a beautiful brunette here and there during the tasting. Oh, her eyes and her high cheeks that infuriated me with longing. I thought of Madalena in La Dolce Vita, how close, how far, the woman lost in the castle. Her lips seemed innocent, unaware of the affect of her eyes and cheeks. Yes, she worked at the winery, yes, she recognized me from before and when she noticed the wind was picking up, she rushed inside to flip a switch and bring the delicate green awnings in. Why do women do such wondrous things, say what they say and disappear? She asked me about the kind of songs I played. I talked and talked but being drunk, I only knew half of what I was saying. My heart sped after her, to find a way in. That's all I wanted. A doorway to her approval. But it's as if my soul had run out of breath in the pursuit. She disappeared, the girl with the brown eyes who rescued the awning. She went away with her white shirt and black cargo pants. I saw her feet in the sandals, I saw her amidst the other heads but little else. Gone. First she left me for the other side of the bar. Then truly gone. In her wake, I spoke in German with a girl from another winery. I understood her words and spoke the best I could. But the brunette with the almond eyes had left and that was that. But I know where she works but I don't want to chase her like dreams I can't get back into. Yes she left and I went inside the bar area with three co-workers, one an older gentleman and two young ladies I work with. In my secret heart I have a spiritual crush on both of them and desired their nearness. One, yes, another brunette with a gentle face, the sweet, kind expression of someone who wants to listen but you want to put your head on her shoulder. And the other, a red head with a voice that could take you into both the future and the past. We talked and the rain fell, we four and the older gentleman told us about a previous wedding at our winery, restaurants in New York, meeting Mr. Antinori, concerts he drove his daughter to. We listened. The red sky crept down below the vineyards. The rain chatted with the grass.I wanted more wine and more wine but it was getting closer to going. Someone stoked a fire at the far end of the outside bar, the flames shooting up, the shadows scattering and wandering back along our faces as the fire settled. The rain pelted on the iron roof and the lull of conversation felt like an ocean going back and forth above our words. The last of the red sky blinked away and the black-blue fade of rain blew wet misted kisses at our skin. A rain that continues and disperses a crowd. Let me go back in time, just once, just once. Let me. There is no one there to caress or hold but the nearness is like a heartbeat outside of my chest. I feel this ongoing burst of dreams, a drunkeness, a melancholy, a wonder, a wistfulness, a tenderness that merges goodbyes with the ensuing gasp of downpour. So it goes. I would have liked to kiss the hands of those two girls, and also the brunette. I could have and I couldn't. I can't. But it's not like that. I don't want to give the kiss of taking and having, of chivalry. Not a kiss that signals possession, a boyfriend's gesture but a kiss that speaks about letting go, letting others stay extraordinary, who they are. Like tasting a wine and knowing its beauty but not drinking it. I want to experience a brief bridge to beauty. Sometimes, when I'm a little drunk I want to walk up to strangers in the streets, in the malls and let them know how much magic exists in their skin. How often are we told how wonderful we are? These faces, all these faces, I wanted to watch them leave, as if I could be a god and let them go. But the skin, skin haunts me, a human fabric that wafts and waves, the scent, a lavish bouquet conspiring to both lead me on and push me away. I wish I could be detached but the desire that seeped into me this evening cannot be readily dispelled. The lights of cars in the gravel drive flicker through me. The vineyards are behind the darkness, the sky rains and the elaborate past comes back to me, taunting me like a song whose title I cannot recall but the verse is fresh, fiery and filled with another memory I will never access. The past is in the void, a wine we dimly remember but I retain it, my imagination and memory fighting for the truth because not everything we remember is what was. And so it goes, here I am, writing and writing and the words I write only insult my longing to have what is eternally gone, retained in the fragments I crush and ferment in my sleepy mind.